For decades, NFL teams sat in the locker room during the anthem. Only in 2009 and after did teams start showing up and get paid for their patriotism. President Trump’s condemnation of NFL players that choose to kneel, rather than stand for the national anthem, reignited a national debate that began with Colin Kaepernick’s decision not to stand for the anthem last season as a protest against police brutality. Over the weekend a plethora of players and even entire teams chose to either kneel or stay in the locker room during the playing of the national anthem – while many NFL owners released statements eliciting support for players who choose not to stand. What many people are missing in this debate is the fact that prior to 2009, NFL teams did not generally stand for the anthem. While having the option to do so individually if they chose to, most of the time they stayed in the locker room during this pregame ritual. In fact, Tom E. Curran of Comcast Sportsnet New England reported, in August 2016, that NFL spokesman Brian McCarthy confirmed that the now common practice of players standing on the field together for the national anthem only began in 2009. Additionally, it has come to light that many of the “patriotic” pregame displays in the NFL are simply propaganda displays that were paid for by the U.S. Department of Defense and the National Guard – meaning that these displays were actually paid for by the American taxpayers. These displays of patriotic propaganda, called “paid patriotism,” were brought to light in April 2015, when Arizona Senator Jeff Flake released a statement condemning the practice. Contrary to the public statements made by DOD and the NFL, the majority of the contracts — 72 of the 122 contracts we analyzed — clearly show that DOD paid for patriotic tributes at professional football, baseball, basketball, hockey, and soccer games. These paid tributes included on-field color guard, enlistment and reenlistment ceremonies, performances of the national anthem, full-field flag details, ceremonial first pitches͕ and puck drops. The National Guard paid teams for the “opportunity” to sponsor military appreciation nights and to recognize its birthday. It paid the Buffalo Bills to sponsor its Salute to the Service game. DOD even paid teams for the “opportunity” to perform surprise welcome home promotions for troops returning from deployments and to recognize wounded warriors. While well intentioned, we wonder just how many of these displays included a disclaimer that these events were in fact sponsored by the DOD at taxpayer expense. Even with that disclosure, it is hard to understand how a team accepting taxpayer funds to sponsor a military appreciation game, or to recognize wounded warriors or returning troops, can be construed as anything other than paid patriotism. 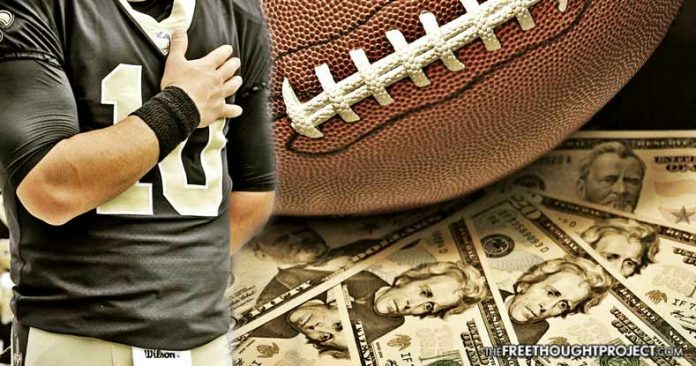 In total, the Department of Defense paid 14 NFL teams $5.4 million from 2011 to 2014 for patriotic propaganda during NFL games. The report by Senators Flake and McCain did not cover the years prior to 2011, thus having no way to verify whether this “paid patriotism” program began in 2009 – the year NFL teams began taking to the field as a team for the national anthem. However, logic would seem to indicate that it was not an organic manifestation given the widespread proclivity of teams and players to stay in the locker room during the anthem—for decades—prior to 2009. The fact that all the teams in the NFL decided during the 2009 season to start coming to the field early for the national anthem seems to indicate that these actions, which were the exact behaviors pushed for in the “paid patriotism” propaganda program, were not organic, but begun as part of the Department of Defense propaganda program. And, while the public argues over whether or not players should stand or kneel, there is no debate that this is government sponsored propaganda that is meant to indoctrinate people into supporting an imperial war machine that fights not for America and freedom, but for geopolitical power, access to energy resources, and hegemonic control of the global economic system as predicated by the petrodollar. Please share this story to help awaken people to the fact that these “patriotic” displays are actually “paid patriotism” propaganda brought to you by the U.S. Department of Defense!